The Green Beret was originally designed in 1953 by SF Major Herbert Brucker, a veteran of the OSS. They wore it whenever they went to the field for prolonged exercises. Soon it spread throughout all of SF, although the Army refused to authorize its official use. President Kennedy felt that since they had a special mission, SF should have something to set them apart from the rest. 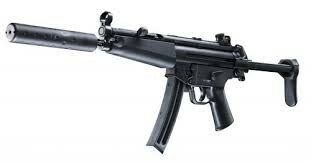 The MP-5 sub-machine gun is a favorite of the Green Berets. This almost bombproof weapon is compact and lightweight, ideal for confined spaces such as helicopters and personnel carriers, and can be fitted with a sound suppressor. Two or even three magazines of ammunition can be lashed together, making a fresh supply of 9mm near at hand. After completing SFAS, you will be selected by the Army SF instructors to attend the "Q Course," the Special Forces Qualification Course (SFQC). Depending on your occupational specialty, this course will last from 6 months to a year; the medical and communications courses last longer. - Two to three times a week, 1,000 to 2,000 meters each time. 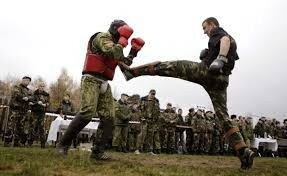 - One day a week, try to swim wearing cammies and boots for 100 meters. - Wear fins when swimming half the time as well. - Four to five times a week, 3 to 5 miles as fast as you can. - Twice a week, do rucksack marches carrying a 30 to 50-pound load marching 5 to 15 miles at a fast walking pace. - Pull-ups, 75 to 100 repetitions (seven to 10 sets of 10 reps). - Push-ups, 200 to 300 repetitions (10 to 15 sets of 20 reps). - Sit-ups, 200 to 300 repetitions (five to 10 sets of 40 to 50 reps). 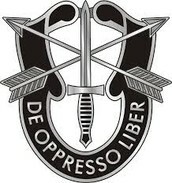 The US Army's SF motto "De Oppresso Liber" is Latin for "To Free the Oppressed." 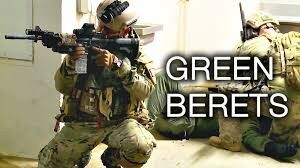 The Green Berets go through intense training to fight for our country. They have the hardest and most dangerous job in our country, and we thank them for their service.